Carl's Curios: What and where from please. All native 'New World' items ? 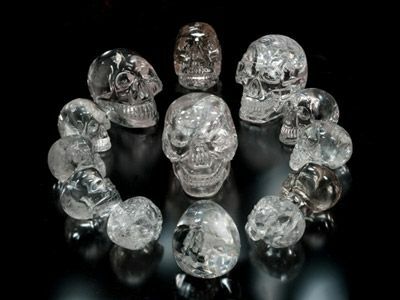 The chrystal skulls puzzle me. 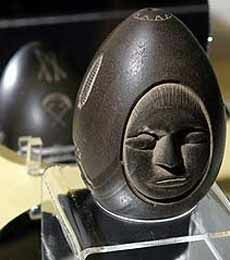 I know of only one, an Inca or Aztec (I get the two mixed up) artifact. As neither of these two civilisations should have been able to make such a thing, not being base metal producers or users, it's puzzled historians for decades. Where and when were that little bunch made? In Central America before the conquistadors spoiled things, I think only these 13 have been discovered so far. Whether it was just before or milenia before I don't know. 9/10 for knowing what and where-ish. Well, I have started off by saying - "All native 'New World' items. Indeed you did and you are largely correct in this broad attribution, but I believe 2 is French despite the Latin inscription and I suspect 4 may be very old world. 1. 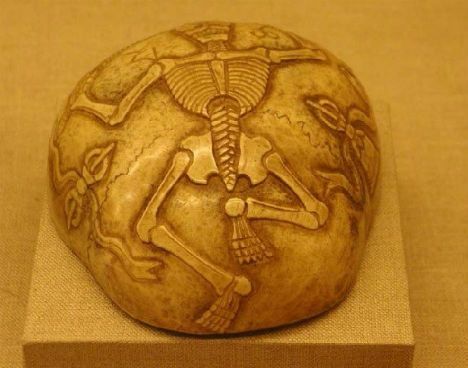 Carved bone (human skull) cup found in Gough's Cave, Cheddar Gorge, Somerset, England and dated 12,700 BC ~ the symbols look distinctly Thibetan to me when compared to a thorpa/dorje/vajra. 2. 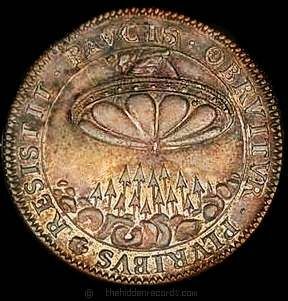 'Resistit paucit : Obruitur pluribus' ~ "He resists with a few, [though] beset by many". 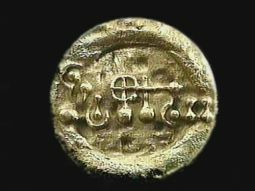 French token/jeton from 1648. 3. The mystery stone of Lake Winnipesaukee. 4. It looks early Babylonian to me with that gil-gal symbol ~ or is it depicting a steel-yard because it's a standard unit of weight? I could realy do with some inputs with this gold disc/coin/weight/medal/seal??? ?